My story is one of love of horse and trail, no matter how old or how ill. 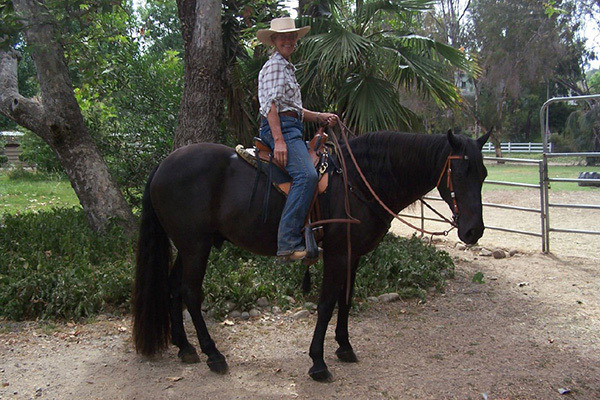 I have been a member of California State Horseman’s Association since August 2007 and enrolled in their Trail Riding Awards Program (TRAP) the entire time. The purpose of the TRAP program is to document use of trails so that they are kept open to equestrians. I am a Select/Senior rider and ride a registered Tennessee Walking Horse, Hawk. He is a most wonderful horse who I acquired and started as a three and a half year old. He will go anywhere directed and do as instructed with a very willing attitude. You do have to be careful if you ride by an open trailer as he will want to hop into the trailer, thinking the rider on his back will duck and clear the roof. He has participated in training for mounted police search and rescue; has been through numerous sensory training sessions and is always willing to be the first horse to take on a new challenge. While training for a mounted search and rescue volunteer position he stood within twenty-five feet of a landing helicopter. The sound, dust and noise did not deter him from standing still. During the same training we were invited to stand in an arena while motor cycle officers did figure eights around us. He has been on trails and encountered a camel, ridden past any number of critters (llamas, turkeys, etc.) and watched as deer flee his area on trail. We ride an area called Peacock Hill, where the Peacocks position themselves on the roof of the barn and present their feathered tails is full glory. We are very lucky to board within easy trailering to Casper’s Wilderness Park, where as volunteers, we have access to an 8000 acre county park with unlimited miles of equestrian trails. One of the expectations for volunteers is to maintain trails and that entails tree trimming on horseback. As a wilderness park we are lucky and have seen cougars cross our path or rattle snakes sunning right in our path. Neither have an impact, just another day in the park. Our last encounter with a rattle snake caught me turned back to talk to friends behind us. Hawk stopped himself, allowed the rattler to uncoil and move off the trail before I was aware of the situation. 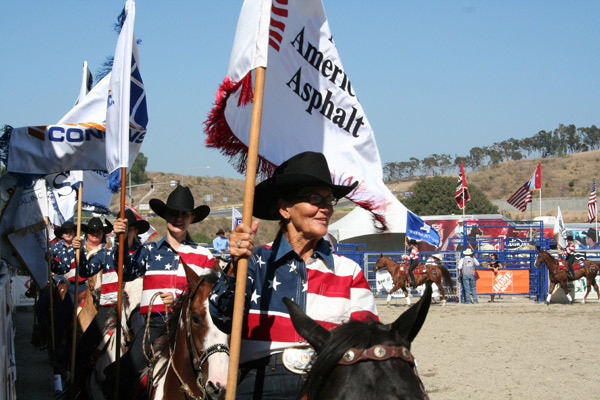 Our barn is located in San Juan Capistrano, California, a large equestrian community, with reportedly the largest equestrian parade in the country: The Swallows Day Parade. Annually Rancho Mission Viejo holds one of the largest rodeos and Hawk and I have been able to be part of a group who parade the very large flags of the sponsors before and at closing each day to the crowds of cheering spectators in the stands. The city supports horses and provides amazing trails in the hills dedicated to open space. He and I have been featured as equestrians riding in the San Juan Creek in a book entitled, San Juan Capistrano Treasures, by the Photographic Art Club. We serve as docents for the Irvine Ranch Conservancy and take registered guests of no more than 10 per ride on the trails they preserve for hikers, bikers and equestrians. Hawk just likes to go. On a horse camping trip I had the opportunity to use a friend’s Synergist Saddle and found that it fit Hawk extremely well. It freed his shoulders and gave him great freedom of movement. The rounded skirt gave him the ability to use his back end and get his feet well under him. It was like riding a cloud in the saddle. Soon after the trial I ordered my own Synergist Saddle, having the fun of designing it in detail. There have been many miles/hours in this saddle on trail as well as many a Trail Trial competitions where Hawk has placed really well, even getting an award for the “Best Dressed”. As of December 2014 we have documented 4843.5 hours in the TRAP program. At 5000 hours I will be eligible for a buckle! I received a beautiful plaque recognizing 3000 hours at a dinner to honor us. The last many months we have had fewer hours in the saddle each month as the nasty big “C” has played a role (don’t like to use the word as I feel it only empowers it to say it). In October, 2012 the diagnosis was made and radiation to my spine took me out of the saddle until the very end of December. Once the treatment was complete I was back in the saddle. Don’t ask the doctor a question when you do not want to hear no, so I assumed it was okay to ride. Hawk was ready to resume his active trail riding program, quiet as always and in good body. In February, 2013 a reoccurrence and chemo began. I was very lucky to feel well enough to ride and did so around the treatment. Unfortunately the chemo only prepared me for a Stem Cell Transplant that occurred in August 2013. Seventeen days in hospital and home on “house arrest” for a minimum of one hundred days while my body hopefully built up its immune system. For those 100 days I had to stay away from anyone and everything. It was so hard not to at least see Hawk. On day 101, with very poor immunity I was able to see him and started riding again. I wore a mask at the barn and on trail for months and never shared with the doctor that I was in a comprised environment. One of the many instructions for Stem Cell Transplant patients is to stay out of the sun for one year! Impossible to do when you so need your equine assisted therapy. My Synergist Saddle has provided me with comfort and balanced position. The horse’s movement is free and smooth. Riding did not cause any pain; it just helped return me to normal life. The design of my Synergist Saddle made it light and easy to handle when I had barely any strength to place it up on my 15.3 hand horse. It would have been impossible for me to saddle him with a standard western saddle. I feel so lucky that my friend introduced me to this saddle and gave me the opportunity to try it on my horse. I loved the ability to design the saddle my way. My saddle, trailer, horse and I are headed to 5000 documented trail riding hours. When we reach that goal we will set our next one.